MetroMark™ 209 is a 3.5-mil matte white flexible polymeric opaque vinyl film coated with removable acrylic pressure-sensitive adhesive on a 90# layflat liner with the Metromark™ logo. This film is designed to accept a variety of solvent-based inkjet, UV curable and latex inks common to wide format digital printing systems. Designed for temporary product markings, temporary point of purchase decals, temporary transportation advertising systems, and tri-vision indoor/outdoor billboard displays. Approved by both CBS Outdoor AND Titan Worldwide for use on buses. Opacity is greater than competitive products, new graphics can be applied over existing decals without bleed through. 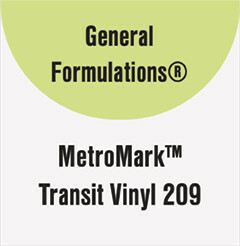 Removes easily even in cold temperatures, unlike competitive products that crack into tiny pieces, MetroMark will peel off in large sheets reducing labor cost. Superior lay flat liner suitable for sheet fed presses.